This newspaper print article was on the front page of the Arts & Entertainment section of the Baltimore Afro-American for the Janaury 14-20, 2006 edition. Trisha Jeffrey as Ti Moune. Photo: Richard Anderson. Starring in the plum role of Ti Moune in CENTERSTAGE'S production of Lynn Ahren's and Stephen Flaherty's critically acclaimed musical Once on This Island is a dream come true for actress Trisha Jeffrey. The role was made famous by Tony-nominated actress La Chanze, who is currently starring as Celie in Oprah Winfrey Presents "The Color Purple" at the Broadway Theatre in New York. 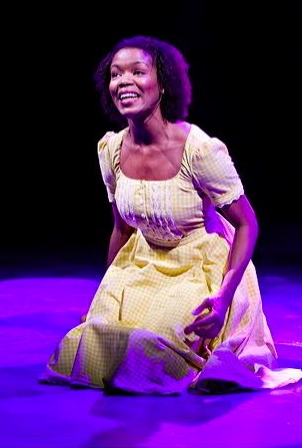 It is one of the few pivotal roles for Black actresses in musical theater. Based on the novel My Love, My Love, Once on This Island tells the story of Ti Moune, a poor peasant girl from the French Antilles who discovers a young man named Daniel near death as a result of a car crash. She makes a promise with Papa Ge', the demon of death, to spare Daniel's life in return for her own. While caring for Daniel, Ti Moune falls in love with him, a relationship that is doomed from the start. The light-skinned Daniel comes from a rich family and is promised to another woman through an arrangement made by their parents, while Ti Moune is a poor, dark-skinned peasant girl who has nothing to offer Daniel except her heart. Since making her Baltimore debut at CENTERSTAGE, Jeffrey has left an unforgettable mark on critics and theatergoers. "I'm just thrilled to be a working actor," says the humble young actress. "There are so many of us who don't have a chance to do a great show or a great role like Ti Moune." After numerous people told her she would be perfect for the role of Ti Moune, Trisha Jeffrey took an interest in learning more about the character. The 20-something actress first heard about Once on This Island when it premiered on Broadway nearly 16 years ago. After numerous people told her she would be perfect for the role of Ti Moune, Jeffrey took an interest in learning more about the character. "People would say, 'You'd be a great Ti Moune'," she said. "And I thought what are they talking about? So I listened to Once on This Island and I fell in love with the music. I've never seen a production of it, so I think that was good for me too." Born and raised in the tough borough of the Bronx in New York City, Jeffrey was a shy and timid young girl, characteristics she would later shed. It was her grandmother who accidentally unmasked her bashful, young granddaughter's vocal talents after catching Trisha and her sister singing in the bathroom. "I got busted and thrown in the choir in church," Jeffrey said, laughing. "I cried the whole time." "I used to be incredibly shy and very, very withdrawn from other girls," she adds. "It was just the way I was. I always wanted to dance, but I never took any classes because I was too shy." While participating on the church choir, Jeffrey met a woman named Ann Sinclair, who would later introduce her to an after-school theater program. "I really looked up to this woman. I went to this program and had a good time. I thought, 'I don't want to be an actor. This is not what I want to do.' People started saying, 'You're an actor.' I said, 'No, I'm not.' I was really terrible too," she said. Eventually, Jeffrey grew to love the art of acting and realized it was the path she was destined to travel. She was accepted to New York's Music and Art and Performing High School, where she majored in voice. While attending the prestigious performing arts school, she studied acting in the evenings. After graduating from high school, Jeffrey attended both Lehman College and the Circle in the Square Theatre School. With a degree, she took a variety of jobs, ranging from teaching to temp office jobs to working for an investment firm. It was then that she realized there was no happiness in her life or career because she was not doing what she truly loved. "One day, I just quit and my folks thought I was crazy," Jeffrey said. "I felt, well, this is great, I'm making good money. I got my first apartment because of this job. It's wonderful, but I'm not happy. It's not what I want." After taking that first important step, Jeffrey landed her first major Broadway musical when she was cast as Crystal in the 2003 revival of Little Shop of Horrors. "It was pretty scary to get my Broadway debut like that," says Jeffrey. Since her debut, the incredibly talented young actress has appeared in numerous regional productions, including Hair, Medea, Lysistrata, The Funkentine Rapture and Jekyll & Hyde: The Musical. Last year, Jeffrey returned to the Great White Way in All Shook Up, a musical comedy based on the songs made famous by the late Elvis Presley. The unsuccessful production failed to find an audience and played 33 previews and 213 performances. With numerous credits on her resume, Jeffrey attributes her success to the love and support of three important women in her life: her grandmother, mother and Elaine Goldstein, her elementary school teacher. "This teacher came to me at a time in my life where I was just struggling," said Jeffrey. "I could have gone the other way. I had many different influences, being an urban girl in the Bronx [and] also being of Jamaican descent. I just had a lot of challenges where I lived, mostly survival, struggling to do the right thing or what was easier to do. "And if I didn't have my grandmother, my mother and my teacher to tell me that I was a smart young woman, that I was talented, that I had a gift and that I should use it, if I didn't have that, I probably would've just accepted the regular day job or gone on a terrible, terrible path. We can't change our paths, we can't change our circumstances, but we can decide what our future will be. We do have that power. And with guidance and support, all things are possible." As Jan. 22 draws near, Jeffrey and the cast of Once on This Island will be saddened when the show comes to an end, but they will value their time together. For Jeffrey, being part of the production has been a valuable learning experience, one she will cherish. "To work with a woman like E. Fay Butler [Erzulie in the show] is an amazing experience, because she's been around the world," says Jeffrey. "Her strength is amazing to be around as a person. She encourages me. She's said to me in times when I've doubted myself, 'You know, you're doing a great job. You just trust yourself.' And that's encouraging. That's encouraging me to go on." When the show concludes its run at CENTERSTAGE, Jeffrey will return to the Baltimore/D.C. area, where she will appear in Studio Theatre's production of Caroline, or Change, the Tony-nominated musical written by Tony Kushner (Angels in America), with music by Jeanine Tesori (Thoroughly Modern Millie). She will play the role of Emmie, which was originated on Broadway by actress Anika Noni Rose. The production will run at Studio Theatre May 17 through June 25. "I'm so excited about that role," Jeffrey says, gleaming with joy. "I caught Caroline, or Change the last week on Broadway. ... It is the 'new' musical because it's not filled with fluff. There's nothing wrong with that. It's not spectacular or anything. It has real life substance, a really wonderful script and an amazing score. I love it, and I hope more people will open themselves up to it."